TV shows like Jane the Virgin, To All The Boys I’ve Loved Before, Black-ish, Empire, and all of Shonda Rhimes’ works, feature primarily Latino, Asian, and African–American casts. Other shows like Quantico and Queer Eye, have great representation for both the Native American and LGBTQ+ community. These great shows and many others are thriving in the on screen diversity department, yet so many are failing to include diversity in the writing room. A Writers’ Guild of America report released that staff employment for people of color actually decreased between 2011 and 2014, from a peak of 15.6% to 13.7%. The number of executive producers of color also decreased in those seasons, from 7.8% to 5.5%. Often enough, a black comedy writer more often than not gets work on a black show. Not to say that black writers can’t work on “white” comedies, but they’re pretty rare. 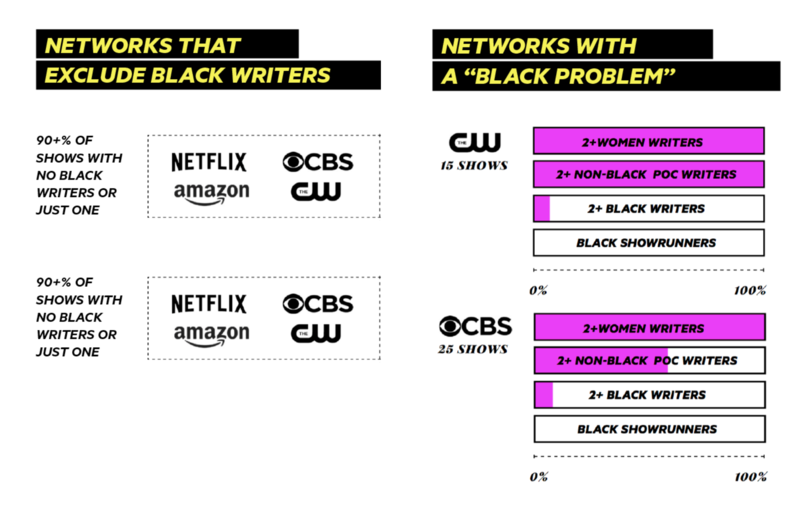 Most black comedy writers get their experience and credits on black shows while also being more likely to hire a cast of color. The “black best friend” character has a role to either revolve almost entirely around a white character or serve as a conscious effort for a white character/writer to appear inclusive. The “old Funny Foreigner” jokes tend to be stereotypes about a particular country by making up a country, choosing a real country almost at random, and ignoring any actual facts about it. The character is just a “generic Latino” or “generic Slav.” Playing up their ethnicity because they can get away with it. Typically when Asian males are featured on television, they are portrayed as either too highly emasculated to be seriously considered as a romantic interest, or just completely asexual. Raj from The Big Bang Theory takes constant jams from the other characters and finds himself unable to talk to Penny because she is a girl. The “wise-cracking help” is any butler, maid, slave, or servant who is heavily sarcastic to their master and/or their master’s guests and yet still manages to keep their job is this trope. Other characters of color generally existing only to support and advance the development of white characters. A study, published this year by USC, found that representation in Hollywood is just as bad now as it was a decade ago. Meanwhile, a report by Creative Artists Agency (CAA), published this past summer, found that movies with a diverse cast performed extremely well at the box office. To be specific, non-white Americans scooped up 49 percent of all tickets sold in the U.S. last year, even though they make up a smaller percentage of the U.S. population ― somewhere around 38 percent. The audience side of things tells a similar story. Films that had what the Creative Artists Agency (CAA) called a “truly diverse” audience ― meaning the audience was between 38 percent and 70 percent non-white ― pulled in around $31 million on opening weekend on average, versus $12 million for overwhelmingly white films. Writers of color exist. They’re alive and flourishing in what seems to be a very undisclosed and concealed way. What writers of color need, are opportunities for to not only break in, but stick around. They deserve the opportunity to be heard.